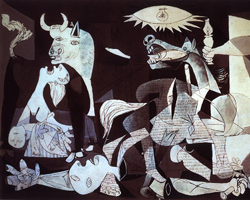 Pablo Picasso's 'Guernica', a work that will feature in the subject of Professor Gearty's talk. Wednesday 20th October 2010, 5.30 pm, in the Ken Edwards Building, Lecture Theatre 1, main University campus. A principal reason the UN was founded was to promote the protection of human rights and for over sixty years this has been a key feature of the organisation’s activities. But with the attacks of 11 September 2001 and the renewed sense of collective national solidarity that followed, the demands of anti-terrorism have challenged those of human rights. New security issues have threatened the human rights status quo, leading to revolts against the authority of the UN by judges around the world. In the Jan Grodecki School of Law Lecture on Wednesday 20th October, Professor Conor Gearty, from the London School of Economics and Political Science argues for a return to the ideals of the UN’s early years and for a moral crusade to re-embed human rights in international practice. Conor Gearty was born in Ireland and graduated in law from University College Dublin before moving to Wolfson College, Cambridge in 1980 to study for a Master’s Degree and then for a PhD. He became a fellow of Emmanuel College Cambridge in 1983 and in 1990 he moved to the School of Law at King’s College London. In 2002, he took up a new appointment as Director of the Centre for the Study of Human Rights and Professor of Human Rights Law at LSE. He has published widely on terrorism, civil liberties and human rights. Professor Gearty is also a barrister and was a founder member of Matrix chambers from where he continues to practice. He has been a frequent adviser to judges, practitioners and public authorities on the implications of the UK Human Rights Act, and has frequently lectured at home and abroad on the topic of human rights. He has appeared in human rights cases in the House of Lords, the Court of Appeal and the High Court. His most recent monographs include Debating Social Rights (co-author Virginia Mantouvalou, Hart, 2010), Civil Liberties (OUP, 2007), Can Human Rights Survive? : The Hamlyn Lectures 2005 (CUP, 2006) and Principles of Human Rights Adjudication (OUP, 2005). ‘The UN and Human Rights: Time for a Great Reawakening’, the Jan Grodecki School of Law Lecture 2010 by Professor Conor Gearty, will take place on Wednesday 20th October at 5.30pm in Lecture Theatre 1 in the Ken Edwards Building on the main University of Leicester campus. The lecture is open to the public and free of charge. More details are available from Sangita Lad, email sangita.lad@le.ac.uk.